Disabled but not unable. Long Island man lives life to the fullest despite his handicap. Adversity, whether large or small, often brings out the best in people. Everyone faces hardship in different ways, but the people who are ultimately successful in their pursuits are those who find ways to create opportunities out of their adversity. In 2004, Walter Reid was diagnosed with a spinal neurological condition called Arachnoiditis. Although his condition has stabilized, it’s also not going to get any better. The 67-year-old Reid has lost the use of his legs and needs a wheelchair or arm crutches to move around. One thing Reid couldn’t continue to do because of his disability was live in their 2,400 square-foot home in Farmingdale, N.Y. The couple had to downsize to a much smaller, one-floor condo in a 55-and-over community. Reid said the transition was not easy but was made much more manageable because of his experience with Life Storage. Because of his inability to move around easily, getting things in and out of the storage unit is difficult and time-consuming. Reid says help from the manager is invaluable. Reid stores all his sports equipment in the unit. That’s right, despite being disabled, Reid is quite the sportsman. The man who used to jog 12 to 15 hours a week, lift weights, play softball and flag football, now plays competitive sled hockey for a team that travels and has corporate sponsorship. Despite being the oldest player on his team, Reid says he can “hang with” the younger players and loves the camaraderie and competition. 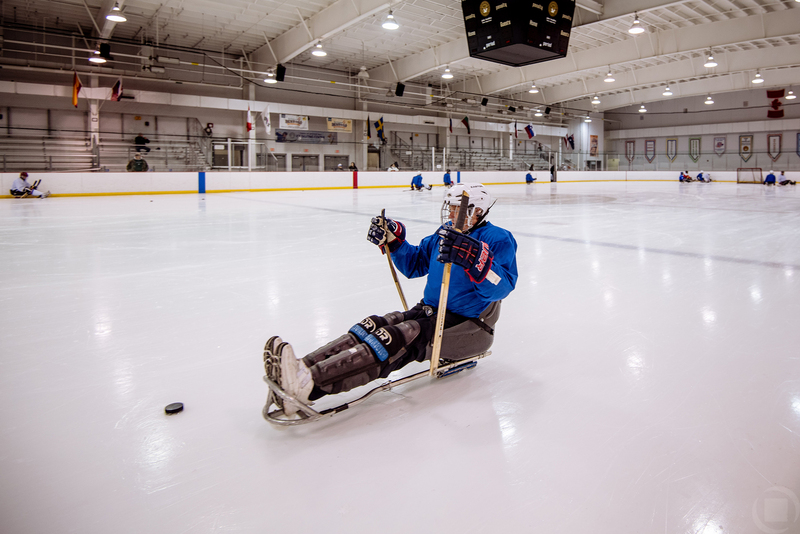 Reid plays twice a week and his team travels to West Point every year to play an exhibition sled hockey game against the Army ice hockey team. Reid proudly remembers scoring a goal against the Army goaltender. Reid, who recently retired from Farmingdale College where he was the Small Business administrator, also participates in wheelchair softball and tennis. He tries to stay as active as possible. Another adjustment Reid made was using hand controls to drive his car. He had to take lessons to learn how to use the hand controls at a state agency. And this is how adversity turned to opportunity. Reid met with Tony Fitzgerald who was wheelchair bound from a terrible car accident. Tony taught Reid how to drive with hand controls and became Reid’s best friend. The Reids, who have a daughter, Marie, and two grandchildren, met at Hofstra University while working together on the George McGovern presidential campaign in 1972. It was in college where Reid stumbled (literally) upon a philosophy that would resonate throughout his life. Reid said he stopped into Gardner’s Restaurant late one evening after “partying a little too much.” He ordered lasagna, and while he was waiting for his food, he read this on a paper placemat on the table: A man is as large as the things that interest him and as small as the things that upset him. “In other words, don’t get bent out of shape over the small things,” Reid says. Walter Reid is a prime example of someone who was dealt a bad hand but persevered. He could have easily thrown in the towel and said, “why me?” He has reason to be upset, but he chooses to remain positive. Instead of dwelling on his limitations due to his handicap, Walter takes advantage of what he can do and continues to enjoy life. He faced his misfortune head on and is now happily leading a fulfilling lifestyle.